When you reach the 30’s, skin care becomes intensive and you really need something that will give you the youthful glow and make your skin baby soft. Introducing night creams and lotions at nights is recommended because it takes care of your skin as you sleep. I am not a big fan of night creams or lotions. By the end of the day, I am so exhausted that I just have enough time to wash my face and I crash out only to awaken to the alarm in the morning. That routine was pretty much set till this wonderful anti-wrinkle lotion from Rustic Art came by. As with most products, I use it for at least a month till I review it so that I can gauge how it has suited my skin. I love the fragrance of this lotion. It’s relaxing and absolutely refreshing. It distinctly reminds me of a fragrance that I used to love as a child, but I can’t seem to remember that fragrance. All I know is that the fragrance triggered a happy memory. I used this twice a day for about a week and using this in the mornings did not work for me. It left my skin a bit oily after about an hour of application. With the running around and not being able to rest triggered that. I did not notice the same when I applied it at nights. I noticed that with regular use, this lotion has left my skin feeling softer. Don’t expect a miracle overnight, use this lotion for at least a month to see the difference in your skin. This 50 ml lotion is priced at INR 675. 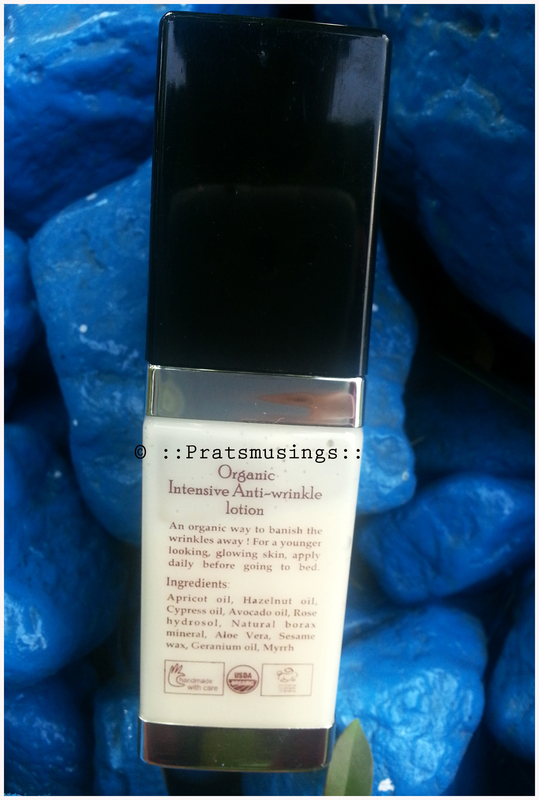 You can buy this lotion at Natural Mantra, GreennGood, ShopHealthy and Organic Shop. This lotion has a shelf life of 18 months. Love the packaging and the bottle. I won’t say it s travel friendly or it can be dunked in your purse or bag because the lid is a bit loose and it may just spill out the contents. The good thing about this lotion is that it gets absorbed very quickly. When you use this at night it hydrates your skin as you sleep. As mentioned on the bottle, use this only at night and yes, shake it really well before you use it. Check the quantity you may need according to your skin type. Don’t use too much of this lotion for it may leave your skin oily. Now, would you want to own this or some other goodies from Rustic Art? If yes, click to view my giveaway sponsored by Rustic Art! Yes! Of course. The price may look on the expensive side for most of us, INR 675 for a 50 ml bottle. But all you need is just one pump of the lotion for skins that are a combination to normal type. For drier skins, you may need two pumps. See the pic, that is all that you need to apply this on the face and neck. And I have a normal to combination skin. Not kidding! With that much being used once a day, the bottle is going to easily last about 6-7 months. Divide that and you are spending about less than INR 100/month on a product that is going to work wonders for your skin. Need a better news? The product is natural and organic. Isn’t that well within the budget? Use this at nights to wake up looking and feeling fresh! I am not sure if this will be suitable for people with oily skin. An organic way to banish the wrinkles away! With the goodness of Apricot, Hazel and Sesame. For a younger looking, glowing skin, apply daily before bed. *Product was sent by the brand, but its hasn’t affected my review. Hey ! Nice one ! 🙂 Does it really work on wrinkles ( like for a female of about 60 yrs of age )? 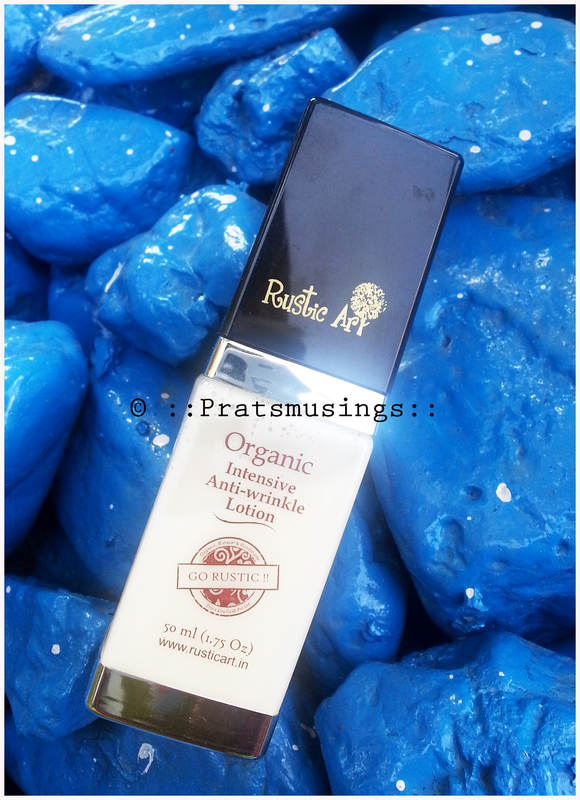 And did you try rustic art’s other variants : lavender hue and facial glow lotion ? Actually nothing about the skin type has been mentioned , plus they are expensive , so I haven’t purchased them as yet . Let me be honest here. It won’t vanish the wrinkles, but will take care of your skin. I use this as a night lotion and I have seen a visible difference in the skin texture. I have not tried any of the other variants as yet. Okay Okay , I got it ! By the way , which skin type will it suit ? I have a normal to combination. Should suit dry skin too, just suspect that you may need a more than required. I am not sure how it will fare on oily skin. Well then it may not be appropriate for summers/monsoon. Thanks ! Na! I would not recommend it using these seasons unless you are always in an AC environment ! Yes I have to agree on that. The baby moisturiser is something I use only in the winters because its hydrates the skin of my boys really well. In the summers I switch to the Omved lotions which is lighter.